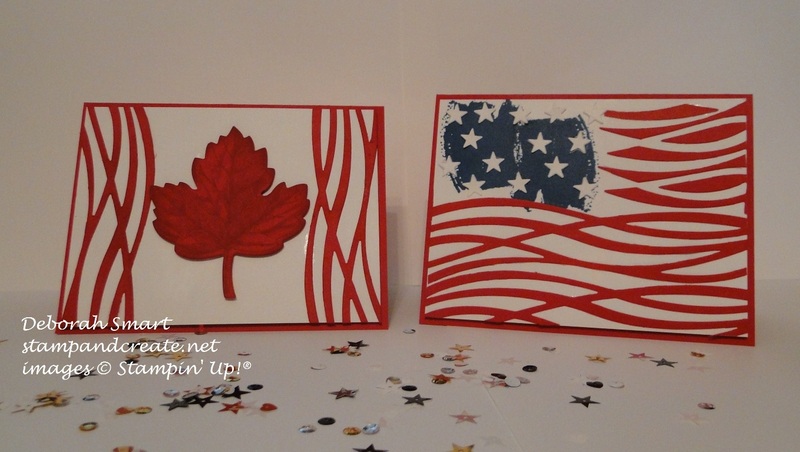 On Friday, July 1st we celebrated Canada Day here; the usual crowds, fun and fireworks 🙂 And of course today, July 4th is Independence Day in the U.S., so I decided to make a couple of cards to celebrate our North American holidays. Can you tell what I used to create these cards? That’s right – Swirly Scribbles Thinlits are used to make the red sides on the Canadian Flag, and the stripes on the American Flag! (please keep in mind – these are my ‘interpretations’ of the flags – they’re not meant to be true renditions!). These came together pretty quickly – and all you need is cardstock in Real Red and Whisper White, and some Dapper Denim ink. 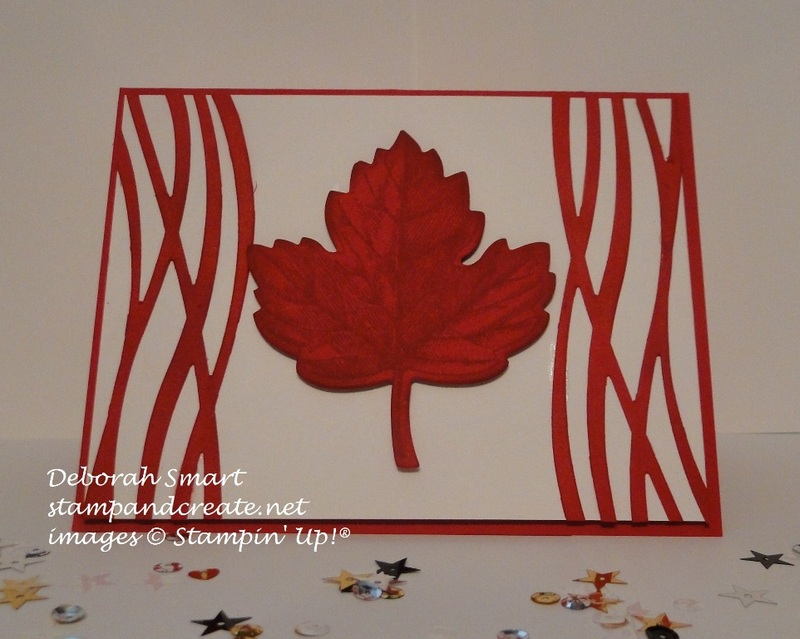 For the Canadian Flag, I stamped the Maple leaf from the Vintage Leaves stamp set onto Real Red cardstock in Real Red ink, then used the Leaflets Framelits and Big Shot to die cut it. I used the Swirly Scribbles Framelits and die cut the wavy scribbles from Real Red cardstock. 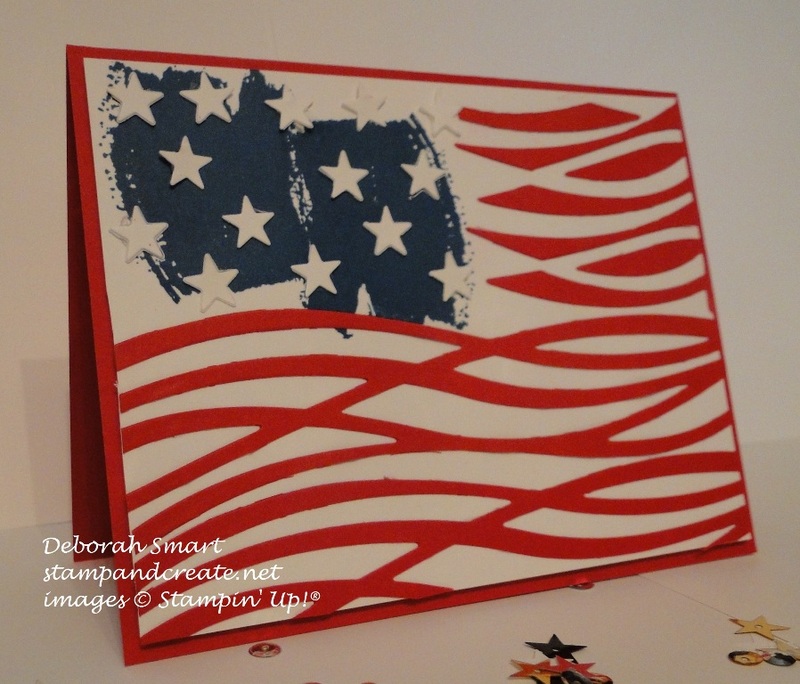 I attached the way scribbles to a panel of Whisper White cardstock using Tombow Liquid Glue, then attached the Maple leaf using Stampin’ Dimensionals. The front panel was then attached to a card base of Real Red cardstock. I started with a panel of Whisper White cardstock, and used the large brush stroke image from the Work of Art set and stamped it twice in the upper left hand corner in Dapper Denim ink. I then used the Swirly Scribbles Framelits to die cut the wavy lines from Real Red cardstock. For the small white stars, I used the stars border framelit from the Mini Treat Bag Framelits, and die cut them from Whisper White cardstock. After attaching the wavy lines with Tombow Liquid Glue, across the bottom of the card front, I attached some smaller die cut pieces to the upper right side. These thinlits sure are fun to play with! I attached the stars using Glue Dots, over the Dapper Denim stamped area, then attached the front panel to a Real Red cardstock base. I hope that if you’re in Canada, you had a safe & happy Canada Day, and wish everyone in the U.S. a safe and happy 4th! If you’re in another part of the world, I’d love to hear about your special day of celebration for your country! Leave me a comment – I’d love to hear about it! If you’d like to purchase any of the products I used to create these cards, please click on the images below, and you’ll be taken directly to my online store. Previous Previous post: Summer Fun with the Blogging Friends! Love this idea! Super cool way to use those thinlets! Hope you had a good Canada Day too. Love, love, love the flags! Genius! !